Fitbit has become the premiere brand for living healthier with technology Take Your Exercise Routine to the Next Level With Fitbit and IFTTT Take Your Exercise Routine to the Next Level With Fitbit and IFTTT Here, we'll dig deeper into the many ways that Fitbit and IFTTT can work together to make your life better. Read More . Using these wristbands, you can track your steps, sleep, and other vital data to reach your fitness goals. Various Fitbit editions are available, and they all carry a different feature set. Some basic ones track just steps, while advanced models track your heart rate, sync phone notifications, and more. We’ve shown you some cool Fitbit tips to get more out of your device 13 Fitbit Fitness Tracking Tips You May Not Be Using Yet 13 Fitbit Fitness Tracking Tips You May Not Be Using Yet Your Fitbit is there to help you achieve your fitness goals. There are a few more things you can get out of your favorite fitness tracker. Try these Fitbit tips today. Read More . But if you’re a traveler and have a Fitbit with a clock, one of the quirks you might have noticed is that your Fitbit doesn’t automatically update time zones by default. Even if your phone is set to auto-update time zones when you cross then, the time on your wrist will be off. 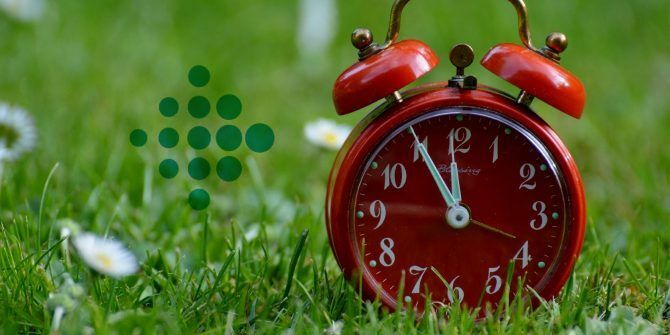 This could make you late for an appointment if you rely on your Fitbit for silent alarms! It’s not hard to set your Fitbit to update the time automatically, but it is buried in the menus. Open the Fitbit app on your phone, then tap the little Account card icon in the top-right corner. Scroll down to Advanced Settings near the bottom of this menu, then slide the Automatic time zone slider to enable it. If Automatic location is turned off, you should enable that here too for best results. Now you won’t have to worry about manually accounting for time zone changes. Of course, if you’re traveling in an area without an internet connection, this might not update at all. For those times, you can switch the Automatic time zone setting to off and choose a time zone yourself. While you’re playing with Fitbit options, take a moment to found out if your fitness tracker is a security risk Is Your Fitness Tracker Putting Your Security At Risk? Is Your Fitness Tracker Putting Your Security At Risk? Is your fitness tracker secure? A technical report highlighted a series of serious security flaws in their designs, theoretically allowing potential attackers to intercept your personal data. What are the risks? Read More . Did you know about the automatic Fitbit time zone setting? Have you ever had to adjust this option manually when traveling? Tell us down in the comments!